While the social trend continued until the early 2000s, the household-structure has rapidly changed over the past decade. Four-member households accounted for 22.3 percent (4.25 million) of the total 19.05 million households nationwide as of March 2009, according to data from the Ministry of Interior and Safety. It was the second greatest by proportion, trailing single-person households whose number and percentage out of the total households posted 6.02 million and 31.6 percent. The third- and fourth-largest were two-member (18.8 percent) and three-member (18.7 percent) households 10 years ago. In contrast, as of March 2019, the number of four-member households was 3.71 million, declining by 12.7 percent, or 540,000, from a decade earlier. Further, the percentage of four-member households slid to fourth with their portion standing at only 16.7 percent out of the total 22.17 million households last month. Over the corresponding period, the number of one-person households surged by 36.2 percent, or 2.18 million, to 8.2 million with its percentage of total households at 36.9 percent. This also indicates that 15.8 percent of the nation’s population of 51.83 million resides alone this year. Simultaneously, the number of two-member and three-member households increased to 4.98 million and 3.99 million, up 39.1 percent and 11.7 percent from a decade prior. The two-member and three-member households ranked second and third, at 22.4 percent and 17.9 percent. Like those of four residents, the number of five-member households dropped 19.6 percent from 1.22 million in March 2009 to 980,000 in March 2019. The number with six fell 27 percent to 213,000 units, which is quite different from the 1960s-80s when grandparents and grandchildren commonly lived together. Data showed that the four-member households were initially overtaken by two-member homes in number in November 2013, 4.12 million to 4.13 million. In addition, the three-member homes also overtook those of four in February 2017, when the respective numbers posted 3.93 million and 3.92 million. Data from the Ministry of Interior and Safety showed the number of people aged 70 or over came to 5.31 million in March 2019, accounting for 10.25 percent of the population. The nation’s fertility rate marked an all-time low of 0.98 in 2018, according to Statistics Korea, falling far short of the average 1.68 for the 36-member Organization for Economic Cooperation and Development. By region, Seoul surpassed the nationwide average in the proportion of one-person households. Out of the collective 4.29 million households in the capital, 39.7 percent (1.7 million) were single-member in the calculation for last month. This means 2 out of every 5 households in Seoul are composed of only one resident. And they, living alone, are 17.4 percent of the Seoul population of 9.77 million. Compared to 34.8 percent in March 2009, the proportion in the number of single households in Seoul recorded a 4.9 percentage point growth in a decade. When the two-member households (890,000 units) among Seoulites are included, 6 in 10 households in the city were single- or two-member. In contrast, the portion of four-member homes (690,000) remained 16 percent of total Seoul households. Experts have continued to point out that the government lacks countermeasures for an aging society under which a rapidly growing number of elderly people live alone. Yet South Korea is not an aging society any more, but an aged society -- a more critical phase -- based on standards set by the United Nations. 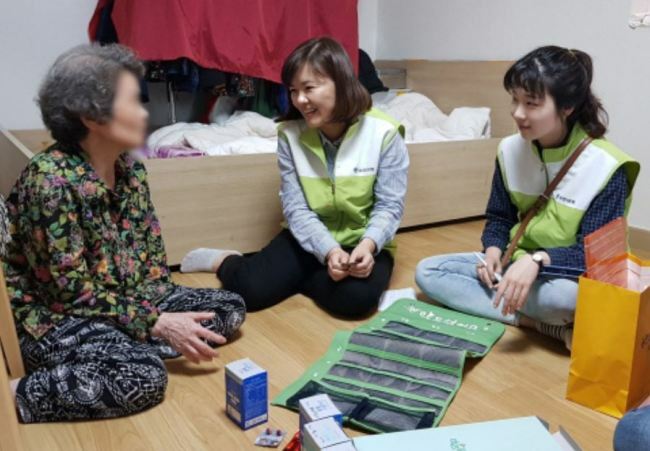 Korea has recently seen the average age of its population quickly rise by 5.0 years -- from 37.2 years old in March 2009 to 42.2 in March 2019, according to the Interior Ministry. The average ages for men and women have reached 41.1 and 43.4, respectively, compared to 36 and 38.4 posted 10 years ago.